By the time you’re done attending the Miami International Boat Show, which opens Thursday at Miami Marine Stadium on Virginia Key, for a couple of days, you’re really freaking done. Two days of diligence is all it takes to see the relevant new high-performance powerboats, engines and hardware at the docks and inside the exhibit tents. That doesn’t mean you shouldn’t come for a third day, especially if you want to take your time meandering through the exhibits. But you easily can get it done in two days. For high-performance powerboat fans, the Miami International Boat Show is still the most relevant and important showcase in the United States. Photo by Pete Boden/Shoot 2 Thrill Pix. Plus, three days of the Miami Boat Show means getting to and from the event and its mostly inedible and overpriced food a third time. Much as the show organizers won’t appreciate me writing this, accessing the venue remains a royal pain in the neck. But while plenty of readers disagree with me, I still believe the Miami International Boat Show is worth your time. Yes, you can read about pretty much everything coming there in “Countdown To Miami 2019” on speedonthewater.com, though of course there will be surprises. There always are a few of those in Miami, and catching it all in person is worth doing at least once. You already know, for example, that Cigarette Racing Team will unveil its 59-foot Tirranna creation powered by a whopping six Mercury Racing Verado 400R outboard engines. But the Opa-Locka, Fla., sportboat and center console builder won’t tip the rest of its typically outrageous dock-display hand until the show opens Thursday morning. Cigarette is celebrating its 50th anniversary this year, so it’s a safe bet the company will unveil a few surprises. You know that Jet, a new 46-foot Outerlimits Offshore Powerboats catamaran, will debut in Miami this week but save for a few sneak peeks of the cat’s graphic elements from Stephen Miles Design you have no idea what the entire package will look like. You’ve seen plenty of pictures of Crypto, the company’s mind-bending SV 43, but if Miles and Dan Kleitz at Outerlimits are anything to go by nothing but a firsthand look does justice to the canopied 43-foot V-bottom. You’ve seen photos of the new Donzi Iconic 44 and Wright Performance 420 catamarans online, but in Miami you’ll have the chance to climb aboard each of them and—if you’re serious about buying one—maybe catch a demo ride. As expensive and difficult as it is for boat builders to display in Miami, most wouldn’t miss it. 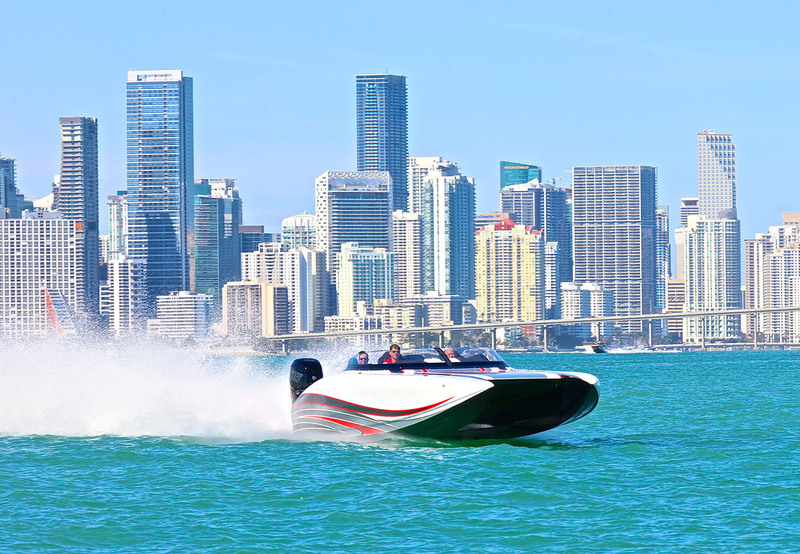 Some of that has to do with perception—as Skater Powerboats’ Tony Cutsuries says, “If you miss Miami, everybody wonders what’s happened to you.” Still, with other boats shows around the country struggling for much more than regional relevancy, Miami remains the ultimate national showcase for go-fast powerboats. That’s not to say that other exhibits such as the Fort Lauderdale International Boat Show, Super Cat Fest in Missouri and even the Florida Powerboat Club’s Poker Run Village in Key West, don’t have merit for performance-boat builders. They do. But none have the marquee value of Miami. Not even close. Come Friday afternoon, my fellow offshoreonly.com columnist Jason Johnson and I will be done with the 2019 International Boat Show and will head to the airport for our red-eye flight back to California. You’ll able to read all about the new stuff Thursday and Friday on speedonthewater.com. Yet as much as we appreciate your readership, there’s no substitute—despite all the legitimate hassles entailed—for being there.